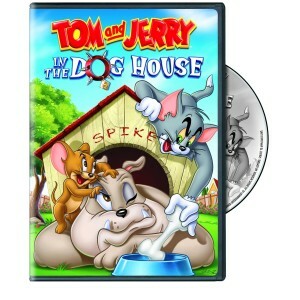 Bryan Reviews ‘Tom and Jerry: In The Dog House’ DVD!!! Here’s yet another Tom and Jerry release from Warner Bros. that makes me giddy with nostalgic joy. 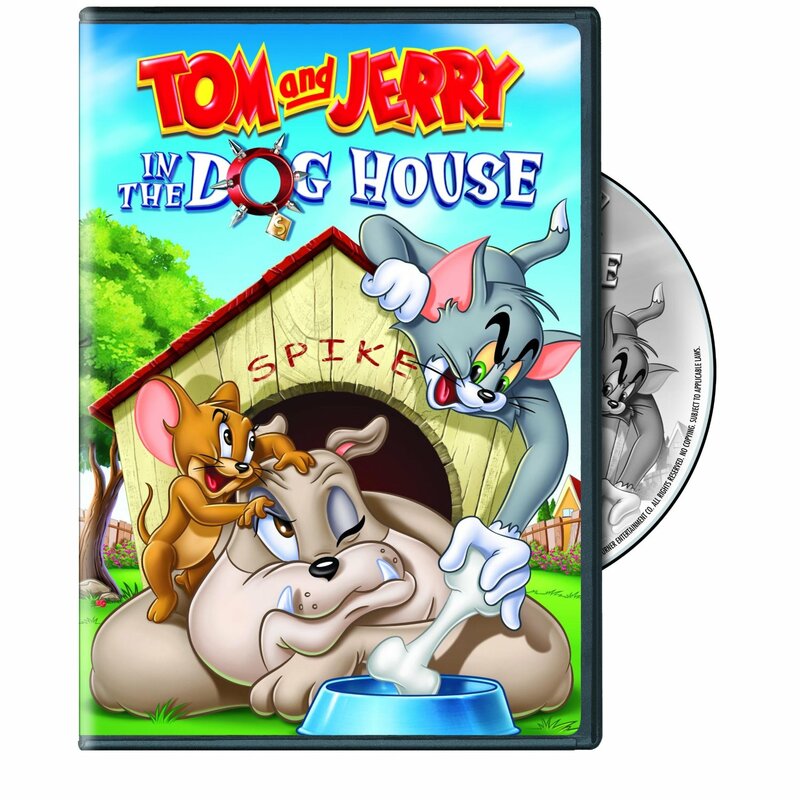 This is ‘Tom and Jerry: In The Dog House’ which has twenty two cartoon shorts featuring the cat and mouse duo along with their sometimes pal Spike the dog. 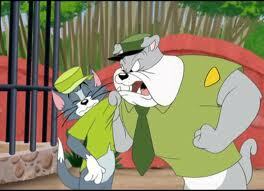 I’m definitely a fan of Tom and Jerry as I grew up watching them constantly. They don’t get old or tiresome. They’re still good for laughs and they do not show their years. It’s great to have these on DVD. So these are you classic Tom and Jerry cartoons that you’e seen before with a certain ingredient. That ingredient is Spike. That lovable giant dog that loves to give Tom a hard time. I’ve always loved Spike, because he is always out for the little guy and always protects Jerry from the vicious Tom. The episodes include: 24 Karat Kat, Destruction Junction, Beefcake Tom, Bend it Like Thomas, Tom’s Photo Finish, Game Set Match, Cat Napping, Cat Fishin’, The Bodyguard, Quiet Please!, Solid Serenade, Slicked-up Pup, Puttin ‘ on the Dog, The Framed the Cat, Tot Watchers, The Invisible Mouse, Pet Peeve, Feeding Time, DJ Jerry, Beach Bully Bingo, A Life Less Guarded, and The Dog House. “Tom and Jerry are at it again, but there’s a new ingredient to their classic chase recipe, just add Spike! It’s hound heaven as everyone’s favorite bulldog, Spike (and son, Tyke) get in on the fun in this pup-packed collection. These 22 doggie-delightful shorts are guaranteed to have fans howling! Join Spike and Tyke in their many dealings with the fast and furious duo. Whether he’s on guard duty, or simply trying to catch a nap, you can bet that Tom & Jerry’s fur-fueled antics are guaranteed to rattle Spike’s cage. 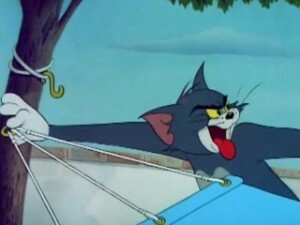 And an angry Spike usually spells hard times for Tom – with a little coaxing from Jerry, of course! Leash-up for some K9-filled fun for the entire family!” Some of my favorite episodes from this DVD are: Beefcake Tom, Beach Bully Bingo, and Pet Peeve. Any cartoon with Tom and Jerry at the beach is gold. I love all of these. The video is in standard definition in 4×3 full frame. All the shorts look really good though for it not being in high definition. The colors are vibrant throughout. It all really looks polished. The audio has a dolby digital mix and sounds great. All the ambient noises are there, and the score flows evenly. Decent sounding audio mix and well rounded picture make this DVD a great presentation. If you are a fan of Tom and Jerry, then definitely pick this up. And for any fan of Spike the dog, this is the set for you. Sadly, there are no extras, but that is the norm for these volume releases with Warner Bros. The video and audio sound great and the twenty two cartoon episodes are a lot of fun to watch. The kids will love them and keep watching them for hours on end. The WB Shop has the DVD for $18.95 right now which is a little pricey, but Amazon.com has it for $14.99 with some independent sellers hocking it for less than $8.00. That is definitely the better deal. If it’s under $15 dollars, I’d pick it up. Bryan’s DVD Review of ‘The Devil Makes Three’!!! Bryan’s DVD Review of ‘Black Hand’!!! This entry was posted on Thursday, March 15th, 2012 at 9:45 pm	and is filed under Film, News. You can follow any responses to this entry through the RSS 2.0 feed. You can skip to the end and leave a response. Pinging is currently not allowed. « Brace Yourself!! ‘Home Alone 5’ Just Got Greenlit! !